To support the quality of life in our Yonge-Eglinton community, I helped initiate the Midtown in Focus review in 2015. After three years of intensive study by our dedicated City Planning Staff, we received a report that told us what we already know: social services and hard infrastructure have not kept pace with the rapid growth in this area. 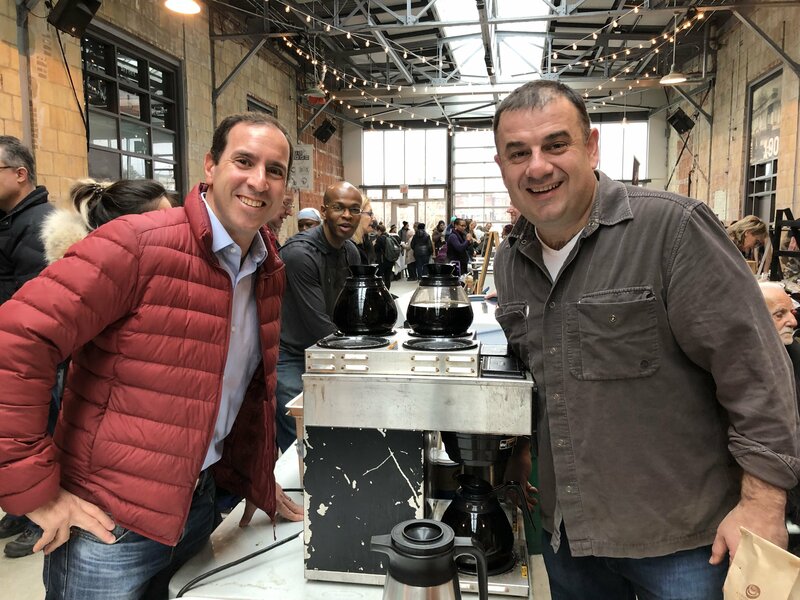 More importantly, the Midtown in Focus study provided up-to-date policy to guide growth in the area and identified necessary capital upgrades, including the basics like pipes and wire capacity, along with expanded social services. City Council approved the strategy in July of last year. The plan is now awaiting final approval by the Minister of Municipal Affairs and Housing. 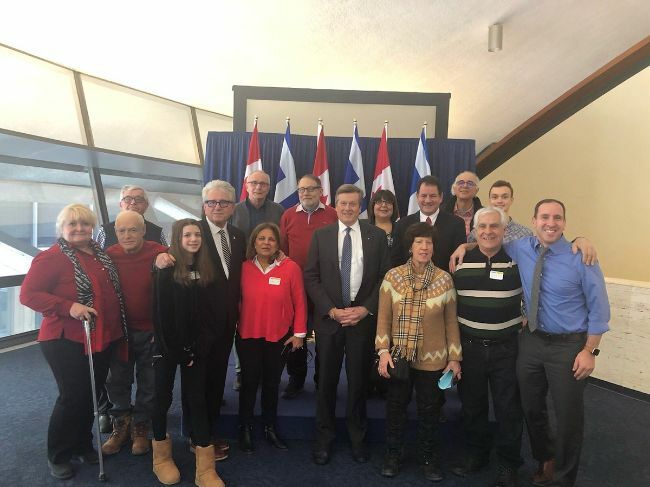 My sincere thanks to the South Eglinton Ratepayers’ and Residents’ Association who worked with my office to organize a letter-writing campaign to the Minister advocating on behalf of their neighbours. When in place, Midtown in Focus will provide a coordinated framework through which individual development applications will be reviewed. In the meantime, there are five proposals for new residential buildings in the Davisville Village apartment neighbourhood, which lies in the south portion of the Midtown in Focus Review area, currently under appeal at the Land Use Planning Tribunal (LPAT). Through a motion at Council this week, I ensured that our city legal team will present a case that asks the LPAT to consider the cumulative impacts of these developments on community services, physical infrastructure, and neighbourhood character, instead of assessing each application on an ad-hoc basis. I know that many of you answered our call to let Premier Ford know that our natural heritage, including the Greenbelt, is not open for business. I am pleased to report that our campaign was successful. 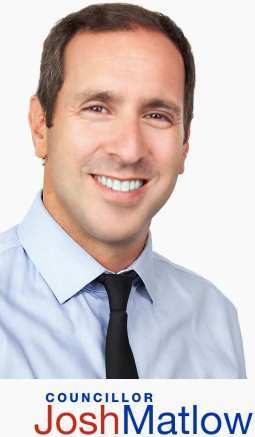 Last week, the Province announced that they would not exempt businesses from environmental legislation. As Midtown residents who often wait three or four trains just to get on during rush hour can attest, addressing the overcrowding on our existing subway must be done before adding more pressure on the system. Transit must be planned based on facts, rather than politics. Take Action to support the Relief Line! A rezoning application has been submitted to the City to permit an 8-storey mixed use building with 26 residential units and 40 below-grade parking spaces. Please join me at 7:00pm on Monday, February 11th at Holy Blossom Temple (1950 Bathurst Street), for a meeting to discuss the proposed development. City planning staff will be in attendance to answer any questions you may have. There is nothing more important than the safety of our community. On Thursday February 28th at 6:30pm at St. Michael and All Angel’s Anglican Church (611 St.Clair Ave. W.), I’m hosting a community safety forum to provide an opportunity for residents to ask important questions to the Toronto Police Service about a number of crime-related concerns that have been affecting our local community, and neighborhoods across the city. I’ve also asked City of Toronto staff to be in attendance. I look forward to seeing you there! 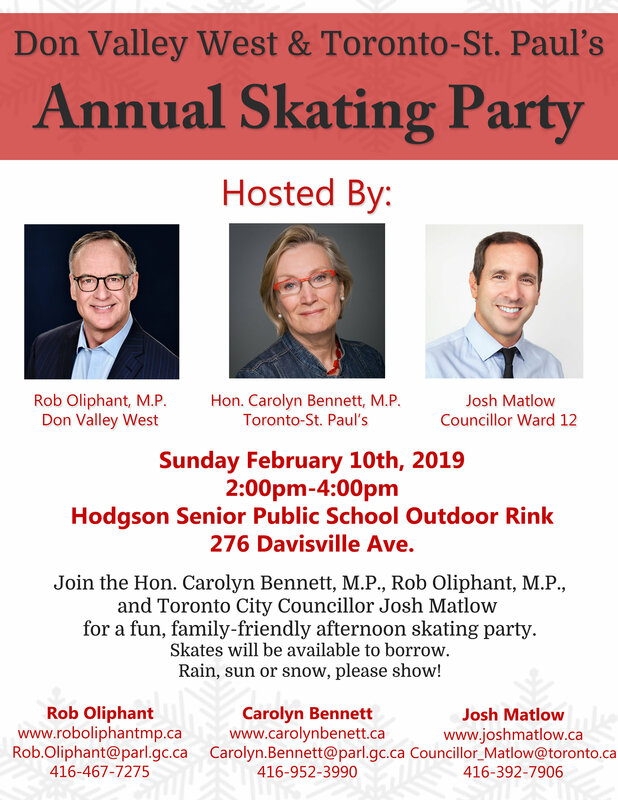 I’m excited to be co-hosting a community skating party with our local MPs, Rob Oliphant and Carolyn Bennett at Hodgson Ice Rink (East of Mt. Pleasant, entrance off Millwood/Harwood, behind Hodgson PS). Please join us from 2pm to 4pm on Sunday, February 10th for a fun, family-friendly afternoon with free coffee and hot chocolate. Check out our flyer here. I look forward to seeing you there! My family and I are avid users of the beltline. Whether it be getting some exercise, or just finding a quiet place to walk and reflect, the beltline provides a natural sanctuary throughout the heart of our Midtown Toronto neighbourhoods. Along with appreciating its natural features, there are also some really special stories that I believe we should share about the history of the beltline railway, and the communities that it ran through. I have visited other former urban railroads, turned recreation trails, and observed how these jurisdictions creatively improved wayfinding, shared the local history, and really brought the heritage trails to life for future generations. I believe we have an opportunity to make creative improvements together on our historical beltline and am excited to initiate the Beltline Stations Project. Using the ‘lost stations’ between Eglinton and Mount Pleasant as focal point, we will be creating a design concept to celebrate the historical, cultural and botanical features of the Beltline. The success of our local businesses and main streets is important to our economy, quality of life and property values. On Wednesday February 20th at 7:00pm at the Village Shul Aish HaTorah Learning Centre (1072 Eglinton Avenue West), I welcome you to attend the Upper Village BIA’s annual general meeting! Both the BIA’s program and budget for 2019 will be discussed. McMurrich Jr PS Visits City Hall! 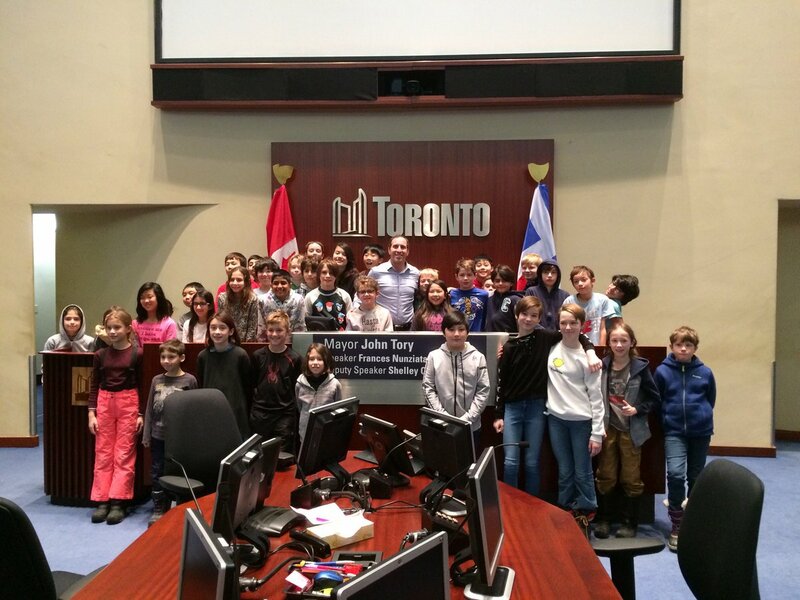 Last week, it was my pleasure to host 5th and 6th graders from McMurrich Jr PS at city hall! I enjoyed a really thoughtful conversation with some amazing kids about our local community and city. Smartphones are critical tools that revolutionize daily life for people who are blind – providing portable, all in one communications and accessibility solutions. But for some, smartphones are out of reach. The unemployment rate for persons with sight loss is triple the Canadian general unemployment rate, making accessing and affording a mobile device difficult for many people who are blind. Phone It Forward gives Canadians a unique opportunity to donate their old phones, receive a tax receipt and empower people who are blind in the process. Through a partnership with Fixt Wireless Repair, donated smartphones are wiped to the highest data security standards, loaded with accessible apps and provided to people with sight loss who need them, along with one-to-one technical training. Join us at our Community Hub for our first Phone Drive event in support of #PhoneItForward! 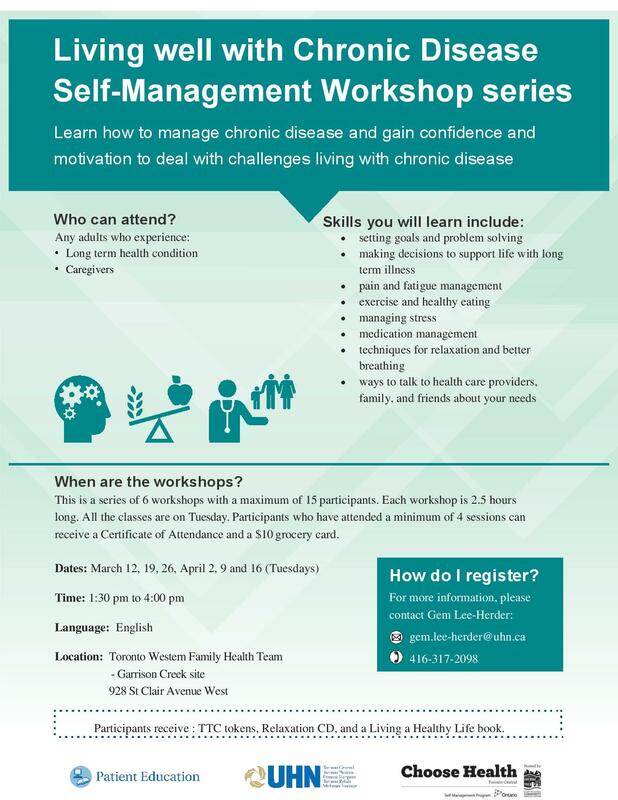 Learn how to manage chronic disease and gain confidence and motivation to deal with challenges living with chronic disease. This is a series of 6 workshops with a maximum of 15 participants. Each workshop is 2.5 hours long. All classes are held on Tuesday and participants who have attended a minimum of 4 sessions can receive a Certificate of Attendance and a $10 grocery card. For more details, please review this flyer for more details. My family and I hope to see you there soon! The Waste Reduction Community Grants Program is part of the City’s Long Term Waste Management Strategy, which identifies the need to support grassroots initiatives that reduce waste. Initiatives eligible for funding include those that promote waste reduction and reuse, increase waste management education and engagement, and align with the City’s Long Term Waste Management Strategy. Priority will be placed on initiatives that promote waste reduction in apartment buildings and condominiums, and involve multilingual communities, equity-seeking groups and Neighbourhood Improvement Areas. Groups eligible to apply for funding include resident, tenant, neighbourhood and business associations, service clubs, community organizations, registered charitable organizations, environmental organizations and school groups, clubs and councils. March 1st is the deadline to submit an expression of interest. For more information about the Waste Reduction Community Grants, the 2018 recipients and the application process is available here. At the public consultation sessions, staff will present and seek feedback on developing updates to the bylaw. Feedback will be used to recommend updates to the bylaw in a report going to Council in spring 2019. Tuesday, February 5, 6 to 8 p.m.
Centre for Social Innovation Regent Park Lounge, 585 Dundas St. E.
The Garage, 720 Bathurst St. Feedback can also be emailed to mlsfeedback@toronto.ca. Residents are encouraged to sign up for e-updates on the Noise Bylaw Review here. The Public Appointments Secretariat is currently recruiting over 300 public members across 50 boards of City boards, committees and tribunals. A full list with the number of potential vacancies is here. These upcoming appointments are a great opportunity to serve Toronto. 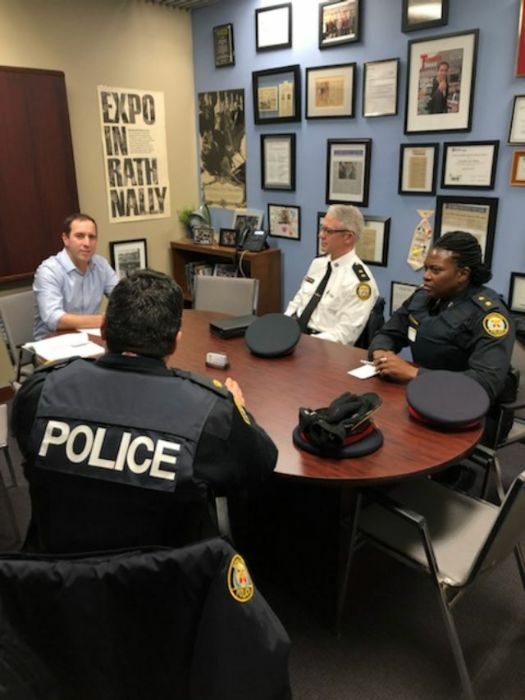 To support this work, the City is currently recruiting for this wide range of board positions – everything from local arena boards to quasi-judicial bodies to City corporations. As you may know, in 2014 Council approved moving to a system of continuous recruitment for public appointments. This means applicants can submit an application for any board at any time and we will keep it on file for two years. As the upcoming vacancies are considered, we will review all applications in the system. Existing applicants and incumbents will be contacted to reconfirm their interest and be advised that they do not need to apply again. StreetARToronto (StART) will keep the city vibrant and colourful by delivering new and enhanced street art programs in 2019. Highlighting this year’s work is an online map, developed in collaboration with Civic Hall Toronto, to better help residents and visitors explore street art located throughout the city. In addition to the map and funding portal, 2019 will see the StART team expand its photo exhibitions and publicly debut an award-winning short film by celebrated Toronto filmmaker Karl Man. Click here for a full list of upcoming events and programs from StART.